Urban Ladder is one of India's leading online shop for furniture, furnishing and decor products. The founders of Urban Ladder are Ashish and Rajiv. Their vision is to set global benchmarks for distinctive products, consumer experiences and honest best practices. 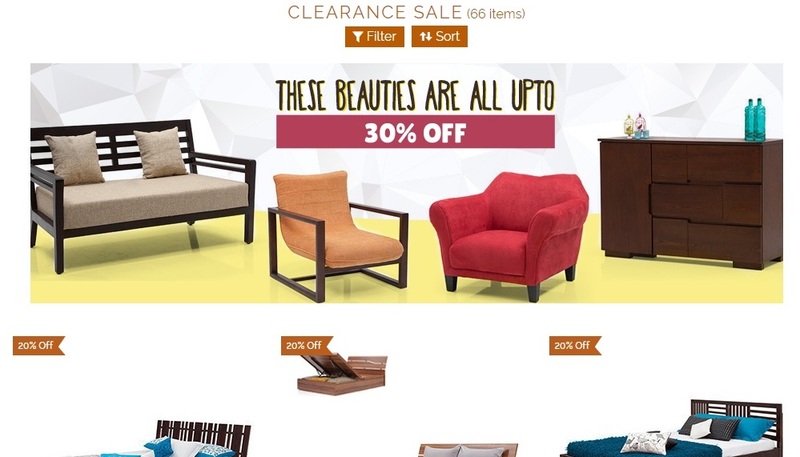 Urban Ladder is currently offering clearance sale with amazing discounts up to 30%. How to avail this Urban Ladder Clearance sale offer? URBAN LADDER COUPON CODE - Not required. 1. Visit offer page of Urban Ladder here. 2. Login if you are a registered user or register if you are a new user. 3. Select the products you desire to buy. 4. Buy the products in discounted price. No coupon code is required. 1. You can also call 080-67400200 to order. 2. Free delivery is available in most of the products. 3. Payment on delivery option is available in selected products. 4. Free installation is available in selected products. 5. This offer is available only on the products available in the landing page. 6. Offer is available for many products like beds, cabinets, dining tables.